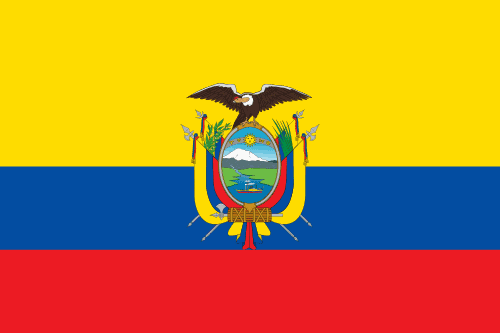 On the comments of my previous post, an anonymous reader asked if I could make "a more distinctive flag for Ecuador". Yes, I can, why not? If you have a suggestion to a future post, you're welcome to do the same! The problem alluded by the dear anonymous commenter is due to Colombia, Ecuador and Venezuela were once part of a bigger country, called Gran Colombia. 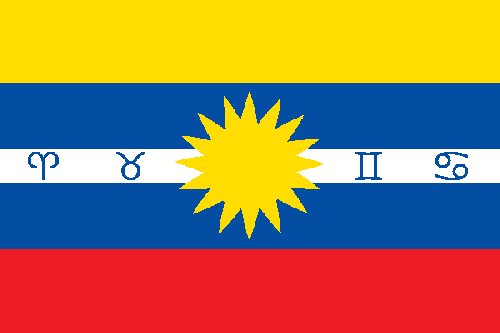 To show the shared heritage, they all adopted very similar flags based on Gran Colombian yellow-blue-red pattern. Below, you can see the Ecuatorian flag, and, more below, the Colombian and Venezuelan flags. You can notice Ecuatorian flag is no more than the flag of Colombia charged with a coat of arms. I'd like to come with something that still remembers the Gran Colombian colors, but with enough distinctiveness. I've come with two similar proposals, basically two variants of same theme. 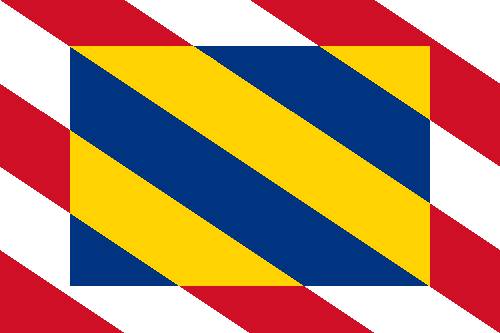 I've made the blue stripe wider, to put, on the middle of the flag, a theme from national coat of arms. The sun represents the independence, and had very importance to the Inca Empire, that included the biggest part of Ecuatorian territory. The symbols of Aries, Taurus, Gemini and Cancer constellations, representing the months March to July, the period that comprised the 1845 March Revolution. 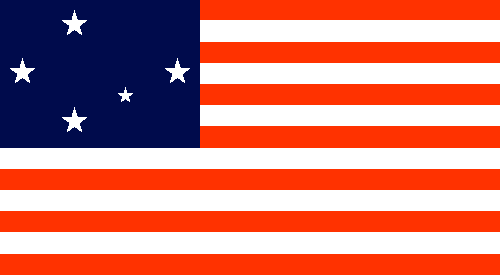 The second flag removes the astrological symbols, gaining a new symbolism. Instead of the ecliptic (zodiac line), the white stripe represents the equator, that gives the country its name. 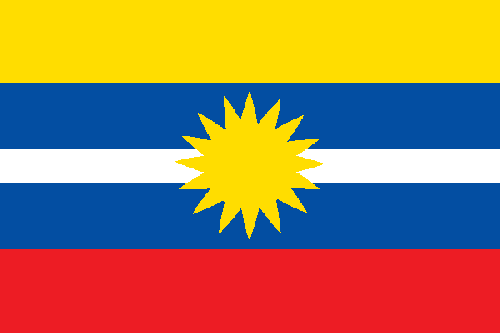 The rest of the symbolism, originary from the Gran Colombian flag, fits the country very well: yellow for the fertile soil, blue for the sky and the Pacific Ocean (in this proposal, you could separate upper blue stripe to sky and lower blue stripe to the ocean), red for the blood spilled to achieve the liberty. Which of the two proposal is your favorite: with or without the signs? McMurdo Station is an American scientific base in Ross Island, Antarctica. The headquarters of Antarctic Vexillological Association is located on the base, so, to celebrate this flag-friendly place, I thought it could be interesting to design a flag to the station. The orangish shade of red is helped by the fact that fluorescent colors are the most visible in the white vastness and, among them, orange is the color that best contrasts with blue. The very dark blue represents winter's eternal night, and the white represents summer's eternal day. The Southern Cross is the a symbol of the Southern Hemisphere and, apparently, it's how it looks on Antarctic. I like the design, althought it's too generic: could be used by any US base in Antarctic continent! Comments are suggestions are welcome. Do you know how to make this flag more distinctive? Is there an astronomer that can confirms if this is the correct display of Southern Cross on South pole? Burgundy is now a historical and administrative region of France. With times of more and less autonomy, it was, historically, one of most important regions of Europe. These days, I was reading about a Burgundian trying to find a better flag for his region. The current flag is a complex banner of arms, quartering the arms of the houses of Valois-Burgundy and Burgundy. 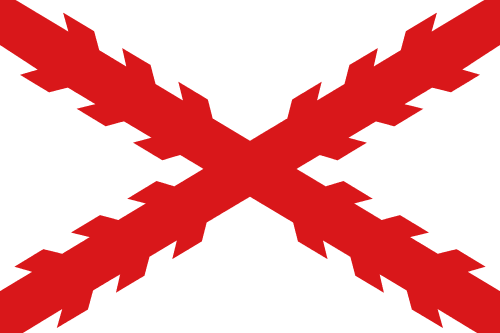 An obvious choice would be the historical "cross of Burgundy", a very clever design but, nowadays, possibly much more related to the former Spanish Empire than the French region. As I wanted a simple design, I decided to focus on the second and third quarters, from the original House of Burgundy. It could have been a good choice alone, but I decided to add elements from the House of Valois-Burgundy, that expanded the duchy to its maxime extension. 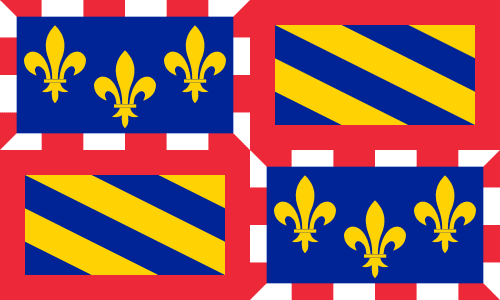 The fleurs-de-lis is typical to French flags, the red and white border being more unique. The counterchanged border is more harmonic to the center and, in my opinion, not too far from original. Hope everybody commemorated International Heraldry Day (June 10th). 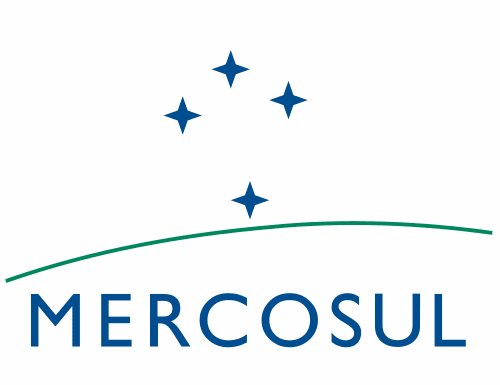 The Mercosur (Mercado Común del Sur in Spanish, "Southern Common Market" in English) is a South American political and economical organization, originally comprising Argentina, Brazil, Paraguay and Uruguay; Venezuela joined in 2012, and Bolivia is in admission process. 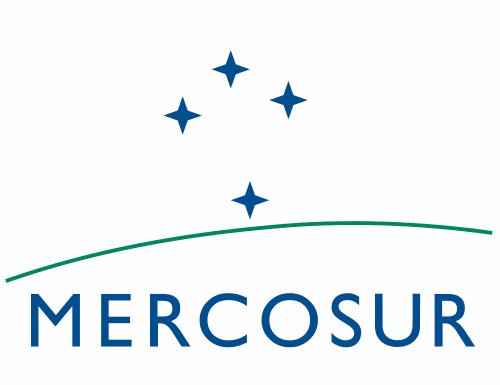 A blog reader called Gonzalez proposed a post about a Mercosur flag that "does not need to be translated". Gonzalez's worry is based with the fact that the flag that flies on Brazil is this, with "Mercosul" (the name of the organization in Portuguese) inscription. 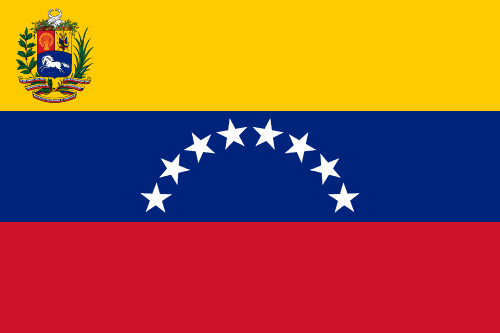 In Brazil, flag law states that this flag should be flown near national flag in many kinds of public bodies. 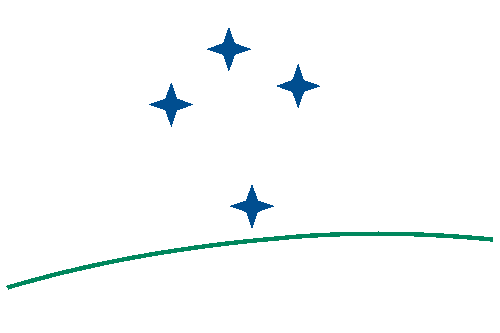 The symbolism of the flag is interesting: the Southern Cross emerging from horizon is a clear reference to the south, and represents the motto "our north is the south" (a reference to compass' north, used as guide). The fours starts also stand for the four founding members. An easy solution for the issue is just removing any inscription from the flag and, catching the opportunity, making the stars bigger. This flag doesn't have the logo aspect anymore. 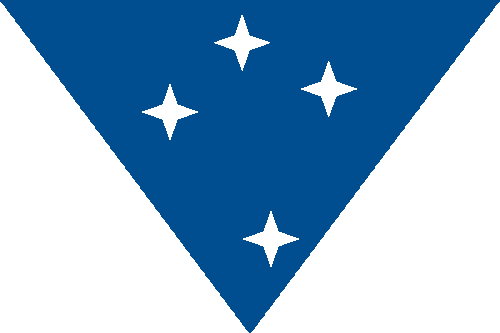 The white stars on blue seems more natural (it's similar to a Mercosur's unofficial flag variant), and the triangle points to the south, as stated on the motto. Once more, I'd like to thank the suggestions, and invite you to send me one.